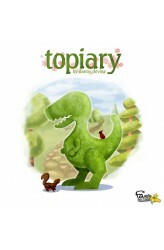 In Topiary, players try to position their meeples on the outer edge of a beautiful topiary garden in order to give them the best view possible. Meeples can see the closest topiary sculpture to them and any behind them in a row or column with a higher number. You can score bonus points by seeing multiple sculptures of the same type. Players slowly fill in the garden by adding cards to the garden until everyone has placed their meeples. https://www.youtube.com/watch?v=8ucoRatBcgc ..